Biography: Vinay has been involved in the ministry for 15 years. While serving God at his local church, he formed his own team and did ministry outreaches in the surrounding villages and districts. 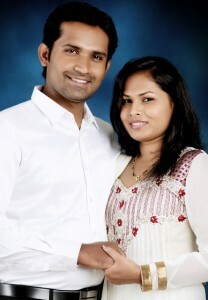 He and Preethi started their fulltime ministry in 2013. People and the word of God are Vinay's passion. He and Preethi have a small church, housing around 25 members. Together, they actively live their Christian life within their community. They visit orphanages, senior citizens and hospitals where they preach the Gospel and heal the sick and brokenhearted. Strengths: Vinay and Preethi operate well in the gifts of healing, prophecy, word of wisdom and discernment. Vinay is a worship leader and musician.